You don’t even know that you should be scared, and frankly, that’s terrifying. What you don’t realize is that you’ve constructed Frankenstein’s Marketing Monster, and it might just come back later to destroy you. Well, that’s morbid. But also frighteningly accurate. Grab some apple cider, a blanket, and curl up by the fire while we tell your scary tale. 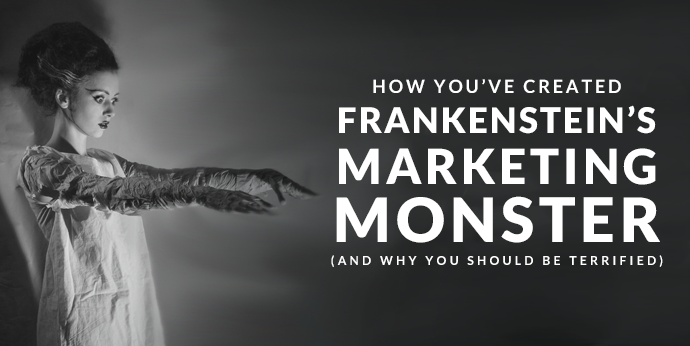 What Is Frankenstein’s Marketing Monster? If your marketing, advertising, and publicity campaigns are rolling right along, you probably think you have nothing to fear. As it stands, your marketing agency and PR representatives probably keep in contact for most of the latest news, but meetings must be called when you want to release advertising information into the world. When it’s time to redesign your website, the process gets even more convoluted as you bring in a website design firm, pass that off to a developer, and then work with a separate SEO specialist to make sure you’ll still be found on Google. At some point, you’ll look up and realize your marketing efforts are made up of parts and pieces from various agencies, representatives, specialists, freelancers, designers—all controlled by your marketing manager or maybe just you, the CEO or owner. If you’re the type of person who flips to the end of the book for spoilers, then you already know what happens. At some point, one of the parts breaks down. Whether your marketing company forgets to set a meeting with your PR firm, your website developer leaves out valuable SEO, or your advertising firm ignores buyer persona information from your marketing company, something is bound to go wrong. In a perfect world, immediate attention could solve the problem. With so many moving parts, however, how will you even know something has broken down until it’s too late? Aside from the horror that awaits when your PR firm sneers at your marketers or your website developers get into an altercation with your graphic designers, there’s also the exhausting prospect of keeping track of everything while you’re trying to run your own business. Who has time for that nonsense? What really happens, though, is not so much a breakdown of communication or a drain of your time and resources. The real danger is dilution of your brand. With so many people trying to stay on the same page, your brand message will be altered, your brand voice incorrectly impersonated, and your brand vision left behind in favor of several different interpretations. What follows is a loss of trust from your customers and the distinct possibility that you’ll never recover it. No one can survive that. How can you beat the beast? By moving all your marketing, advertising, publicity, social media, content strategy, website design and development, and graphic design needs to one highly experienced, fully inclusive marketing firm. With one firm, your branding message and collateral will remain consistent, which gives you the ability to grow and reach new consumers. Don’t waste time herding various marketers, branding consultants, web developers, and SEO experts, and you’ll never create Frankenstein’s Marketing Monster in the first place. This blog originally appeared here on October 6, 2015.